Over the last few weeks, reports of potential suitors eyeing Twitter for a takeover have sent the social network’s stock skyrocketing, up roughly 35% from about $18 in mid-September to as high as $25 yesterday (Oct. 5). But in after-hours trading last night, Twitter’s shares started plummeting back to Earth. The drop followed a report in Recode debunking recent rumors that both Google and Disney were going to bid on the company. 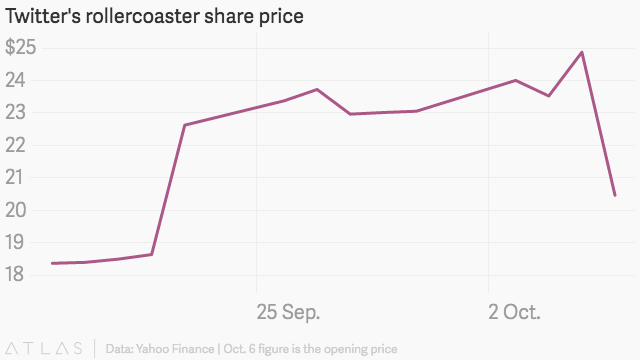 The stock opened at $20.46 this morning, down roughly 18% from its close yesterday. Twitter apparently wants to wrap up any potential sale by its next earnings call, slated for Oct. 27. This does not leave a lot of time for interested parties, if there are any left, to kick the tires, get their paperwork in order, and submit a bid.